Social Learning is one approach to learning design, an approach where we combine the best of ‘formal‘ learning (the story that the organisation tells), with the best of the community (the co-created, sense making, ‘social‘ story that the community writes). 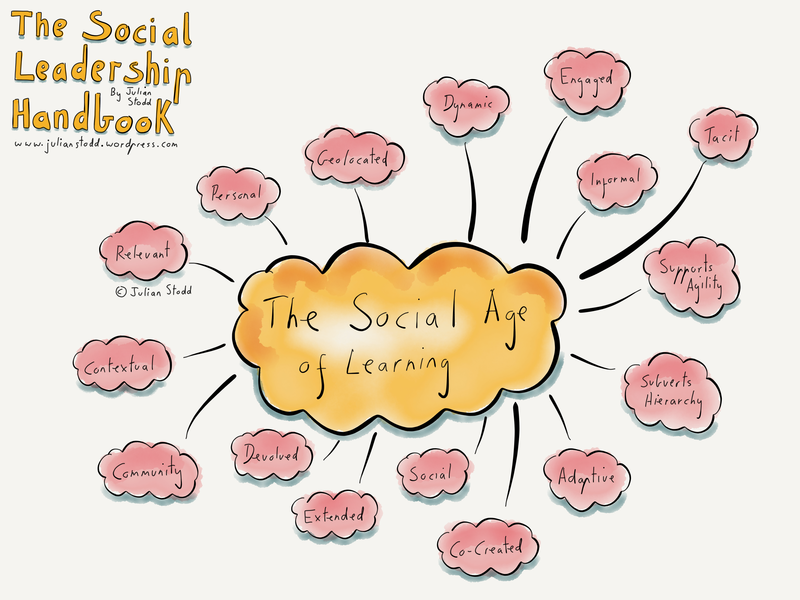 Social Learning must be designed as such: it’s not simply a case of adding a forum alongside an eLearning course, or putting a workshop online. 1. Social Learning is a specific design approach: it involves us forming a learning journey that weaves between formal and social elements. We must specifically design the spaces for co-creation to occur. 2. Social Learning is facilitated by technology, but it’s not caused by technology: think first about design, and secondly about which technologies you have or can acquire, to facilitate it. 3. 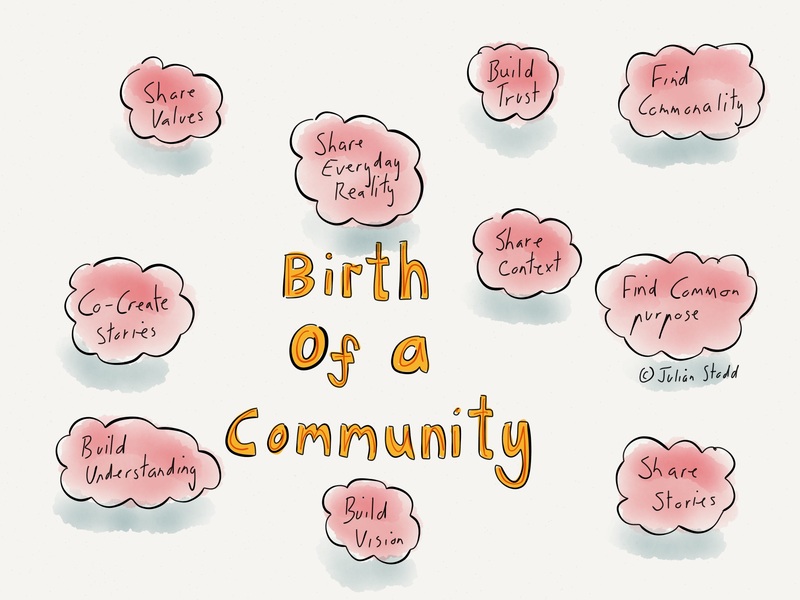 Social Learning happens within communities: consider all aspects of how communities form, are guided, and capture their story. Worry less about trying to engineer ‘engagement’. Engagement will come if you have strong communities. 4. Rules should be sparingly written and ideally co-created. Worry less about what you will do if things go wrong, more about how you can earn the right for things to go right. Set out your ‘must have’ rules, but create space to listen to what the community wants too. Find a middle ground. 5. Social Learning typically takes place over time: create the time and be unafraid to clearly ask for commitment. Remember that the learning is ‘social‘ because it actively includes the conversations, so you need time for those conversations to occur. 6. 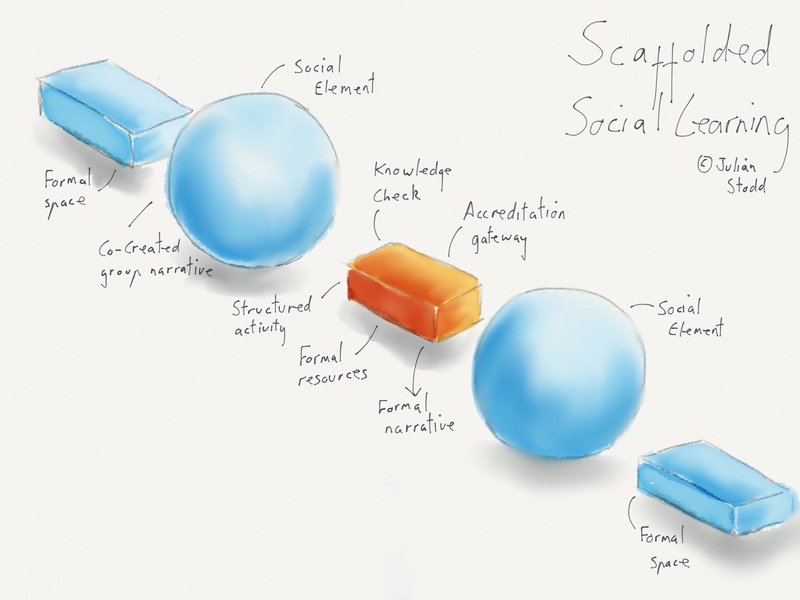 Scaffolding is important: in my own approach to Scaffolded Social Learning, i emphasise that we need strong ‘scaffolding’, the design pathway that shows the relationship between formal and social elements. Start by building the scaffolding for your project. Everything else hangs off that. 7. Assessment is not always about tests: the stories that people write, individually and in communities, can form a great model of assessment. 8. Less assets, more spaces: in Social Learning, we typically have fewer ‘hard‘ assets, such as podcasts and eLearning elements, and more ‘co-creative’ spaces – structured conversations to ‘make sense’ of and share understanding. That’s what we are aiming for: the understanding of the community. 9. Typically we would have no case studies: if you need a case study, ask the community to find one or write one. That’s very much the ‘Social Learning‘ approach: more grounded in our reality than hiding in theory. 10. You will need to consider ‘facilitating roles‘, the people (both within the formal system, and within the community), who help others to succeed. Actively think how you can recognise, develop and reward these people. They will be central to your success: the community managers, storytellers and mentors. This entry was posted in Social Learning and tagged Learning, Learning Design, Scaffolded Social Learning, Social Learning, Technology, Top Tips. Bookmark the permalink. Thanks Julian will put in list form and use in the Learning Strategy tomorrow. Great turnaround. Back to your hols! Hi Julian, just stumbled upon your post and skimmed through. I particularly liked Number 4: Rules. “Worry less about what you will do if things go wrong”. Yep, I also suggest to simply get things started and if they head into the wrong direction, just fix it and keep going. Sometimes it’s worth to start all over again… ‘Social learning’ as a topic to write about is still new to me, but I try to cover it at some point on http://www.courselounge.com as well. Maybe then talk about it again. Thanks Mark.